A stylish presentation of luxury, beauty and elegance. Inspired by Chinoiserie, artist Diane Marsland creates a new mixology of eastern exoticism. Showcasing dazzling landscapes, printed on luxurious hand-woven silks with complimenting wallpapers and accessories to match. 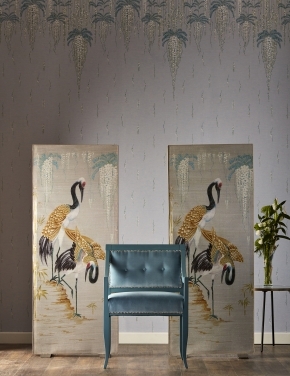 Join us on the 11th of March at Christopher Peacock Showroom to preview the collection on fabulous fabric sound absorbing panels. Discover the design journey and watch a ‘live’ painting demonstration in celebration by Diane.